After the interminable wait for a San Francisco Muni bus, its eventual arrival is a cause for celebration and relief. And for the next three months, it could also prove to be a rare treat if your route happens to feature one of the four city buses serving as vehicles for a public art project from local artist Todd Gilens. 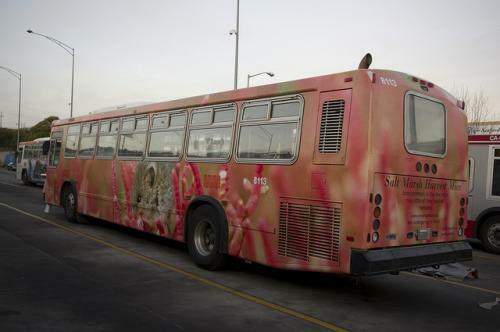 Starting this month, four Muni buses will go under the disguise of Gilens’ “wraps” displaying images of four local endangered species– the Coho Salmon, the Mission Blue Butterfly, the Brown Pelican and the Salt Marsh Harvest Mouse. Like the rare animals they exhibit, the buses in the aptly dubbed Endangered Species project will make guest appearances to all neighborhoods as they circulate throughout the city, dispatched to different routes every day. A far cry from the assault of gaudy advertising that we see on our buses every day, these eye-pleasing graphics will be a welcome sight. In spite of the small size of the Endangered fleet, calming images of a flock of pelicans skimming over a cerulean sea or a pearlescent butterfly fluttering as the bus jostles about the city’s pockmarked streets are sure to strike a chord with harried citizens. The project aims to reintroduce these species to our minds, while emphasizing the necessity of preserving their habitats through urban growth that is compact and transit-focused. The project has been in the planning stages for years, with SPUR and other organizations such as Nature in the City and the Greenbelt Alliance providing various forms of support for implementation. The idea was born in 2006 when Gilens learned the SFMTA’s “Transit Effectiveness Project," or TEP, was measuring maintenance, driving efficiencies and ridership statistics. Thus, the question arose over how we as city residents value our environment. Like San Francisco’s plethora of parks, curbside cafes and ubiquitous street vendors, public transit vehicles are part of our daily landscape and urban experience. Since the temporary mobile art installment uses buses and their environments as a medium, Gilens and all the many others involved hope the project serves as an investigation between city and region, social and environmental values and our dedication to maintaining a fifth endangered species: public transit itself. Transit benefits to ecological systems include reduced sprawl, traffic noise and air pollution while providing a social framework and collective investment for the good of everyone. As we would like to see the beautiful and essential creatures flourish amid urban growth, we should also have the foresight to not let our public transit deteriorate. SPUR’s promotion of urban growth as the antidote to suburban sprawl can only be accommodated if transit-oriented development takes precedence. San Francisco’s heavily used but notoriously troubled transit system needs to expand if it is expected to meet the needs of a growing city. The 700,000-strong daily ridership of Muni buses and trains is stretching the current system, and per-capita transit use is second only to that of New York. 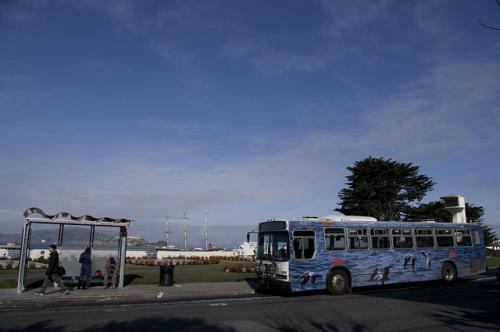 However, since most commuters rely on buses rather than trains – unlike most major US metro systems – Muni is the slowest and most overcrowded system in the country. This is the first time the SFMTA has donated full-wrap advertising space, clearly underscoring the need for civic engagement on funding, maintaining and extending the reach of our transportation infrastructure. For those whose curiosity is piqued by the endangered buses and their decorative fauna images, a web link on the rear of the bus (www.endangerbus.org) provides information about the habitats of the featured species, the role public transit plays in conservation, and several non-profit organizations’ work on urban design, conservation and social values.